Polyamide and polyester non-absorbable yarns – Odetka a. s.
We produce braided surgical sewing sutures, hollow, in the range of 1 – 8 EP, with diameter from 0.100 to 0.899 mm made of Polyamide PAD 6 dTex44 /12 and Polyester PES den 45/1 smooth according to the internal standard PN 45 19 21 7101/80/12, which is fully in accordance with valid European legislation, is continually updated and annually aligned with the requirements of customers. Knitted surgical sutures are thermostabilized and washed in household soap. We supply surgical sutures on conical spools of 280 g. The spool itself is packed in chlorine-free paper, further in plastic bag and supplied in a cardboard. The entire production, material purchase, warehousing and product dispatch process is fully controlled and certified according to ISO 9001: 2008 and ISO 13 485: 2012. These surgical sewing materials are produced and sold by Odetka, a.s. as a semi-finished product. Currently these materials are marketed by Odetka’s business partners according to valid European legislation. Odetka delivers them as non-sterile in industrial packaging, but provides business recommendations on the website for sterilization and storage in accordance with valid legislation. 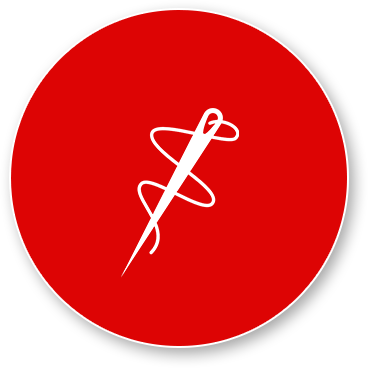 Procedures of sterilization and storage of surgical sewing materials from PAD6 and PES are identical and are determined according to valid European legislation. These products are classified within the meaning of Government Regulation No. 336/2004 Coll. as an invasive inactive implant group IIb. and are labelled according to valid European legislation as non-sterile and nonabsorbable surgical sutures. Their sterilization will be ensured according to ČSN EN ISO 11137-1: 2006 – Sterilization of Healthcare Products – Radiation Sterilization – Part 1.- Requirements for Development, Validation and Continuous Control of Sterilization Procedure for Medical Devices and according to ČSN EN ISO 11137-3: 2006 – Sterilization of Health Care Products – Sterilization by Radiation – Part 3 – Instructions for Dosimetric Aspects in a Special Radiation Centre. The standard sterilization dose is 25 kGy. Properly packaged remains sterile for 6 months. Is supplied in boxes as non-sterile in rolls according to customer specifications, treated with hot-air drying in thermobox at 105 °C, protected against dust and external influences by polyamide bag and stored in cardboard boxes. Detailed adjustment is provided in the Odetka User’s Manual. Storage must be carried out in undamaged suppliers packaging at a temperature of 15-20 °C and a humidity of 40-60%. The storage period may not be longer than one year. The absorbable materials degrade in the body. They degrade when the wound or cut is healing. Non-absorbable materials resist attempts of the body to dissolve them. Nonabsorbable materials can be removed by the surgeon after the wound is healed. Surgical sutures are made from both natural and synthetic materials. Natural materials are, for example, silk, flax and catgut, which is essentially dried and modified gut of a cow or a sheep. Synthetic sutures are made from various textile yarns such as Polyamide (Nylon) and Polyester made especially for medical purposes. Absorbable synthetic surgical sutures are made especially from polyglycolic acid and glycol polymers. Majority of synthetic sewing materials have their own names like Dexon or Vicryl. Waterproof Goretex was also used as a surgical suture as well as thin metal wires. Doctors have been using sutures for at least 4,000 years. Archaeological records of ancient Egypt show that Egyptians used flax and animal tendons to close wounds. In ancient India, doctors used beetles and ants to close wounds. They placed these living creatures on edges of the wound, so that these creatures would squeeze the edges of wound with their pieces, then the doctor removed the bodies of the beetles, and the pieces stayed in place and held the wound closed. Other natural materials used in the old days were flex, hair, grass, cotton, silk, pork bristles and animal guts. Although the use of surgical sutures was widespread, sutured wounds often became inflamed. The nineteenth-century surgeons preferred to burn the wound, which was often a terrifying process, before sewing with the risk of infecting the patient and death. Well-known English physician Joseph Lister discovered disinfectants in the 1960s, making surgery much safer. Lister dipped sutures from the catgut in phenol which sterilized them at least on the surface. Lister spent more than 10 years experimenting with catgut to find a material that would be flexible, strong, sterilizable, and absorbable in the human body in an adequate amount of time. The German surgeon made advances in catgut processing at the beginning of the twentieth century, leading to really sterile material. Catgut was basic absorbable suture material in the 1930s, while doctors used silk and cotton when there was need for non-absorbable material. Technology of surgical stitching progressed with the formation of polyamide (nylon) in 1938 and polyester at similar time. As artificial textiles have been developed and subsequently patented for surgical stitching, sewing needle technology has advanced. Surgeons began to use atraumatic needles which were stitched to the surgical suture. This technique saved the need for threading the suture into the needle directly in the operating room and also allowed the diameter of the needle to be comparable to the diameter of the surgical yarn. In the 1960’s, chemists developed new synthetic materials that could be absorbed by the human body. These were polyglycolic acids and polylactic acids. First, absorbable suture material was made of natural catgut material. Nowadays synthetic absorbable sewing materials are used more than a catgut. The FDA began to require the approval of new sewing materials at the beginning of the 1970’s. In 1976, the Medical Equipment Changes Division was added, and surgical stitching manufacturers have since been forced to seek product approval before launching. Manufacturers must adhere to the “Good Manufacturing Practices” rule and ensure that their products are safe and effective. Patents for new sewing materials are then valid for 14 years. Natural sewing materials are made of catgut or dissolved collagen, or cotton, silk or flax. Many countries no longer accept catgut or collagen for sewing because of problems with animal protein products. Synthetic absorbable sutures can be made from polyglycolic acid, polylactic acid or polydioxanone, glycolide copolymer and trimethylene carbonate. These different polymers are marketed under specific brand names. Synthetic nonabsorbable surgical sutures can be made of polypropylene, polyester, polyethylene terephthalate, polyamide, various nylon types, or goretex. Some surgical sutures are made of stainless steel. Surgical sutures are often coated, especially the knitted or rolled ones. They can also be dyed to be more distinct during the sewing process. Only the FDA approves the dyes and coatings that can be used. Certain approved dyes are: logwood extract, chromium-cobalt-aluminium oxide, ferro-ammonium pyrogallol citrate, D&C Blue No.9, D&C Blue No.6, D&C Green No.5 and D&C Green No.6. The coating used is chosen depending on whether it is absorbable or nonabsorbable suture. The absorbent suture contains Poloxamer 188 and calcium stearate with polyglycolic copolymer. Nonabsorbable suture can be coated with wax, silicone, fluorocarbon or polytetramethylene adipate. Surgical needles are made of stainless steel or carbon steel. Needles can be nickel-plated or electroplated. Packaging materials include waterproof foil such as aluminium foil as well as cardboard or plastic. 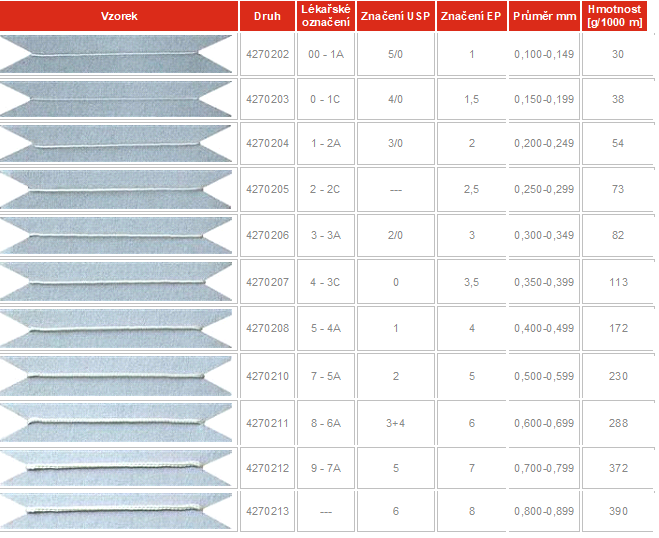 Sutures are designed to suit many different needs. Surgical suture for abdominal surgery, for example, differs from cataract surgery. Thus, no type of surgical suture is suitable for all operations or surgical procedures, and medical designers have come up with surgical sutures that differ in their characteristics. One type may be more absorbable but less flexible, while the other is extremely robust but resistant to knotting. It offers many options to surgeons. Designers of new types of surgical sutures must take into account many different factors. The extent to which suture is degrading is very important not only in the length of stitching but also in the knot. However, some sutures must be elastic so that it stretches and do not break. Others must hold firmly together. Surgery sutures manufacturers use specially developed machines to test and study different types of sutures. New types of sutures are also tested in laboratories so that they are soaked in different solutions and tested on animals. The manufacturing process of surgical sutures does not differ very much from that of other synthetic textiles. The raw material is polymerized and the polymer subsequently extruded into a fibre. The fibre/yarn is stretched and knitted on knitting machines, which are also found in factories manufacturing polyester yarns for the garment industry. The production process usually takes place in three factories. One factory manufactures surgical fabrics, the other produces needles and the third factory, called finishing, joins needles and stitches together, packs them and sterilizes. The first step in making surgical sutures is to create crude polymer. Workers will measure certain number of chemicals to produce the polymer in chemical reactor. In the reactor the chemicals are combined (polymerized) and extruded from the reactor in the form of small pits. In the next step, workers throw the pits into the extruder. The extruder has a nozzle that looks like a showerhead that has many small holes. The machine melts the polymer, and this melt flows through the small holes, forming many individual filaments. After extrusion, the filaments are tensioned between the two rollers. The filaments stretch up to five times their original length. Some sutures are made as a monofilament. Others are knitted or rolled. 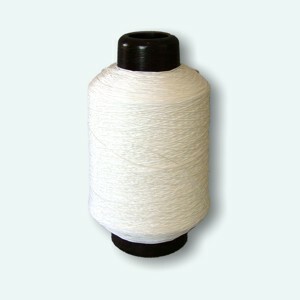 For the preparation of knitting, the extruded monofilament must be reeled onto spools, which are then attached to automatic knitting machines. Such machines are usually of non-modern design and can also be used in the manufacture of garments. The number of filaments weaving together depends on the width of the resulting surgical suture of the particular type. Very fine sewing consists of 20 filaments, medium sewing of hundreds and very thick stitching consisting of thousands of twisted filaments. The knitting machine produces an endless strand of knitted material. Knitting happens very slowly and the machine usually runs 4 weeks non-stop. The process is almost completely automatic. Workers at the factory check the machines for a fault, replace empty spools for full, but generally the manufacturing process requires very little human work. After knitting, surgical sutures passes through several stages of secondary processing. Sutures that were not knitted also pass through these phases directly after extrusion and primary stretching. Workers place the material on another machine to ensure further tensioning. Compared to the first stretching, this process can take only a few minutes and stretches the material by only 20%. The sewing then passes through hot roller, and any lumps, hairs and tiny flaws are thus ironed. In the next step, workers put surgical sutures through an annealing furnace. The annealing furnace exposes the sutures to high temperature and stitching, which essentially compares the crystalline structure of polymer fibres into one long chain. This step may take several minutes or several hours, depending on the type of surgical suture being made. After annealing, sutures can be coated. The coating materials vary depending on the material from which the suture is made. Suture passes through the bath of the coating material, which may be in the form of a solution or in thick pasty state called slurry. All major manufacturing steps at the processing plant end at this point. Now staff of the Quality Control Department test the produced batch from many different qualitative points of view. Workers make sure that suture matches the width, length and strength of the European Pharmacopoeia of the EP or the American Pharmacopoeia of the USP, looking for physical defects and testing the solubility of absorbable sutures on animals and in tubes. If the batch passes all of these tests successfully, it is packaged and sent to the finishing plant. Surgical needles are manufactured in another plant and are also dispatched to the finishing plant. Needles are made of fine steel and are drilled longitudinally. Workers in the finishing factory shorten sutures to standard lengths. The surgical suture is then mechanically inserted into the hole in the needle and the needle is threaded to the suture. The process is called swagging. Subsequently the suture attached to the needle is placed in plastic bag and sterilized. Sterilization varies according to material of suture. Some sutures are sterilized by gamma-radiation. In this case, suture is completely wrapped. The whole package, usually sealed plastic bag inside the cardboard box, is inserted on the treadmill. The closed package is moved under the lenticular lenses that emit gamma radiation. This process kills all microbes. Suture is now ready for shipping. Some sutures do not withstand gamma radiation and must be sterilized in a different way. Sutures and needles are packed in plastic bag, but the bag remains open. Bags are moved to gas sterilization chamber filled with ethylene oxide gas. Then the plastic bags are closed, put into boxes or into other packs and are ready to be shipped. Surgical sutures, as medical supplies, are subject to strict quality control. All the raw materials that arrive to the factory are tested to make sure they have those properties that have been declared. Each batch of stitching is tested after the main manufacturing steps for different physical properties such as diameter or strength. Surgical industry has developed a number of sophisticated tools to test the special features of surgical sutures such as knot safety or tissue resistance. Testing the diameter, length and strength of surgical stitching is done at the finishing factory. The finishing factory must also test how well surgical suture is attached to the needle. Surgical Suture Quality Indicators are defined by the United States Pharmacopeia in the United States and the European Pharmacopeia in Europe. New surgical sutures are still being developed to better match specific surgical needs. In addition to developing new types of surgical sutures, scientists also come up with alternative methods of wound closure. The first surgical stapler was invented in 1908, but the stitching technology really did not develop until the 1990s. Precise machines are capable of applying absorbable staples thin as four human hair, just below the top layer of the skin so that subsequent scars are minimized. Similar device, first tested on patients in the United States in 2000, is a surgical zipper. Surgeon places zip on the wound and the zip closes the wound, eliminating the need for surgical stitching. Once the wound heals, the patient can wash the zip in the shower. Another method of surgical wound closure is the ever-developing surgical glue. Surgical glue is less painful than sewing if the wound has to be closed without anaesthetics. Glue leaves fewer scars in some cases, and it is easier to work with postoperatively.